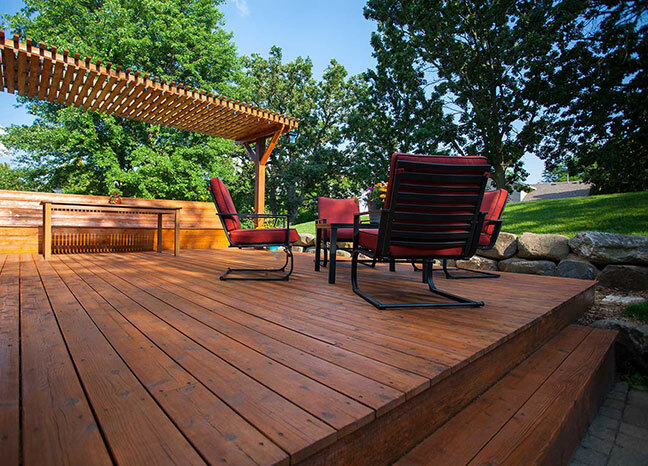 What is the best way to prepare the Deck for Staining? cleaning comes down to two basic questions…power washing vs. not power washing and are chemical cleaners really necessary? Power washing can be a great tool to use when getting your deck ready for staining. It makes the job go faster and does a better job of cleaning than garden hose pressure alone. If you don’t know how to power wash, ask someone to help you that does. Properly used, power washers can do an amazing job but improperly used, they can do more damage than good. You don’t need a lot of pressure so stay away from the big units. Limit yourself to a washer that offers a maximum pressure of 2,000 pounds, or so, and then use a fan tip of 30 or 45 degrees to spread that pressure out even further. When washing, go with the grain of the board, end-to-end…avoid washing across the grain of the boards. Chemical cleaners can do a great job of opening up the porosity of the boards, making them absorb more stain and this can help the project last longer. They also help with the removal of the old stain and debris, allowing you clean with less pressure, reducing your risk of damage to the wood. There are also a lot of really safe, environmentally friendly products on the market like Defy Wood Cleaner ( www.defywoodstain.com ) that are safe to use and won’t harm plant life and vegetation. If these advantages mean something to you, then use a cleaner, if not, then don’t. Chemical strippers are just plain nasty. The chemicals are harsh, they can burn your skin and damage your plants. Then why ever use them you ask. Sometimes there is simply no other choice. In cases where you need to remove solid color stains or layers of built up semi-transparent products, the only way to get them off might be with a stripper but, in an effort to avoid using a chemical stripper, I would always recommend at least trying to get them off with a cleaner first. Chemical brighteners, or oxalic acids, are pretty easy to use and offer several positive advantages for your project. First, after cleaning, they will brighten the wood back to the light color it had when it was new. This helps to insure the color of stain ends up more like what you expected and not just dark brown. Secondly, it opens up the pores of the wood even more, helping to insure that the stain is easily absorbed in to the boards and doesn’t just lay on the surface to eventually peel. Lastly, if you have used a chemical cleaner or stripper, these chemicals may have left the wood in a highly alkaline state. Applying an acid brightener, followed by a heavy rinse, will restore the woods ph level to neutral (around7) and avoid the possibility of your project failing prematurely due to “caustic burn” or being eroded by the chemical residue left over by the cleaning process. Sanding can often times due more harm than good, as it can close off, or crush, the wood fiber in the boards, thus reducing the board’s ability to absorb the stain. Sometimes though, it’s the only thing that will work. In areas of the deck under mats, under grills, shaded by soffits etc., you may simply have no choice but to sand and, if you do, try to use a course grit paper (80D). Using a fine grit paper will no doubt make the boards look great…you can get them as smooth as a piece of furniture…but that’s not what you want outside for staining. Remember, every step of the process has something to do with creating porosity in the wood so that it will absorb more stain. The more stain it absorbs, the longer the project will last. Sanding does not help with this.